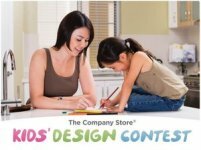 The Company Store Finds the Next Kids’ Comforter Designs to Benefit Homeless Children In the U.S.
You may remember reading my earlier post about how The Company Store, celebrating their 100th anniversary, announced the launch of their Kids’ Design Contest, a program geared at inspiring creativity while supporting art education and charitable work among America's youth. Under this initiative, The Company Store would accept original artwork from children 12 years and under. The winning piece would then be transformed into a comforter print for their ongoing Buy One, Give One Comforter Donation Program, in which The Company Store donates a new comforter to a homeless child for every comforter sold. Well, the winners have been carefully chosen and announced and I wanted to make sure you were up-to-date on how this contest turned out! What do you think of the three winning creations? My daughter absolutely LOVED the Sweet Dreams design. Which of the winning designs is you or your child's favorite? Disclosure: I received a Company Kids beach bag in exchange for posting this information. 2 Responses to The Company Store Finds the Next Kids’ Comforter Designs to Benefit Homeless Children In the U.S. I Like The PEACE Blankett!I Love Your Web Site God Bless! Hi Melissa. Yeah, I’m agree with your daughter. The sweet dreams is indeed the best for me too. It’s so nicely drawn.